Stereotactic Body Radiation Therapy (SBRT) has advanced on many levels in recent years with significant developments in new radiotherapy technologies and the manner in which these treatments are administered – producing better overall results. An important component in this equation involves new immobilization solutions that improve patient comfort as well as treatment accuracy while actually reducing overall costs. As with all radiotherapy treatments, the effectiveness of SBRT is largely dependent on locational accuracy, yet the slightest patient movement can cause the radiation to miss the essential treatment location and possibly harm unaffected areas. Traditionally this meant that clinicians needed to employ bulky and restrictive components to immobilize patients. Aside from causing patient discomfort and added anxiety, these immobilization components are typically quite bulky making them difficult for clinicians to manipulate and increasing set-up time, in addition to requiring substantial storage space. Aktina Medical took a unique approach to SBRT immobilization with the introduction of its Memorial Cradle 2 Lateral Support System. Developed in conjunction with Memorial Sloan Kettering Cancer Center, the Memorial Cradle 2 features a unique modular design that increases clinicians’ flexibility and streamlines workflow processes, while causing less stress to patients undergoing treatment. 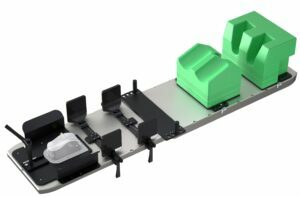 The system’s lateral support paddles mount directly to the treatment couch eliminating the need to mount and adjust additional accessories or hardware. This unique method for patient allows for excellent flexibility in SBRT positioning with a direct index to table crossbar and paddle sets. There are numerous benefits to this approach including: Active patient support by applying lateral side pressure to increase treatment setup accuracy and reproducibility; modularity of design that improves cost-effectiveness by requiring fewer components and reduces storage space requirements; the elimination of bulky overlays minimizes attenuation and increases treatment options and flexibility; universal compatibility with virtually any treatment or CT couch top. Based on direct input from clinicians in the field, we will continue to enhance the Memorial Cradle 2 SBRT immobilization solution with the addition of new and even more efficient modular components further improving the prospect for better overall patient treatment and recovery.